Morlun is a Spider-Man villain. He was created fairly recently compared to most of Spider-Man's other main villains. He was created by J. Michael Strazcynski and John Romita Jr. in 2001 with Amazing Spider-Man #30. Morlun is part of a family who call themselves the Inheritors. The Inheritors are extremely long lived but not immortal. The Inheritors feed and draw strength from eating Totems (People who have links to animals). Their DNA seems to include all animals within it, making them a kind of super-totem. He and his family are the major villains in the Spider-Man story the Spider-Verse. 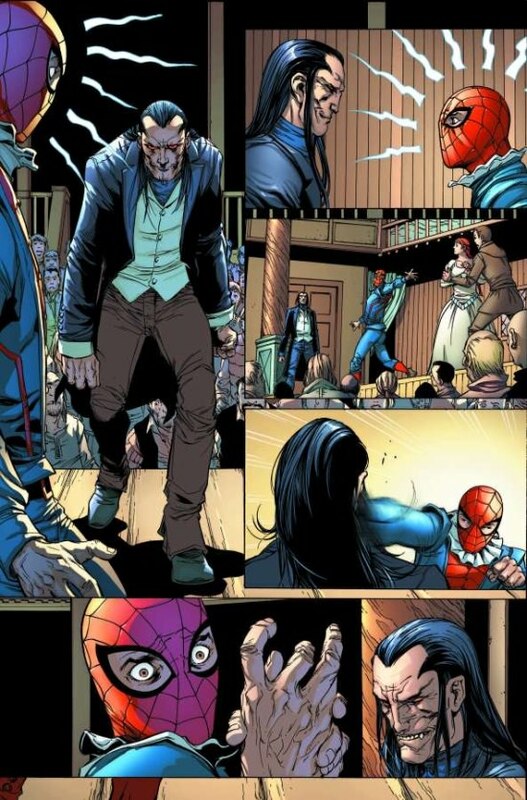 Morlun looks like a gentleman dressed in old clothes. This is perhaps due to his old age he is said to be centuries old. Personally, he always reminds me of the creepy vampire who Louis encounters in theater of the vampires in Interview with a Vampire. Morlun is not a vampire however, as an inheritor / devourer of Totems he is far more dangerous. The Spider-Verse was a great Spider-Man event and now it is a great Spider-Man movie. Here are our favorite Spider-Verse items as found on Amazon. Morlun is part of a family called the Inheritors who live on dimension 000. Countless years ago they battled and defeated the master weaver which allows the family to travel between dimensions and hunt down totems. While the family can hunt down all kinds of totems they prefer spider totems. 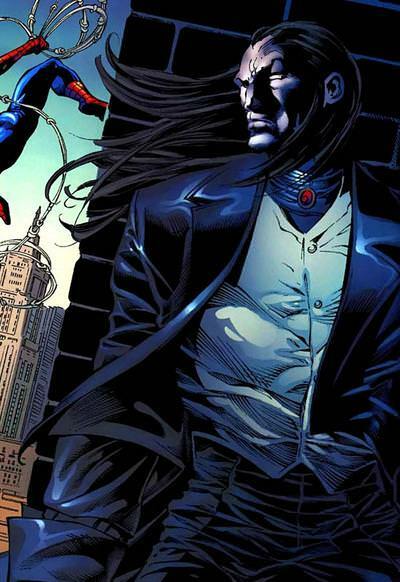 Morlun is the heir to the throne of the family when his father eventually passes away. With resources from many conquered worlds at their finger tips that family has vast resources. They even use some super powered agents as hounds to seek out and battle totems for them. 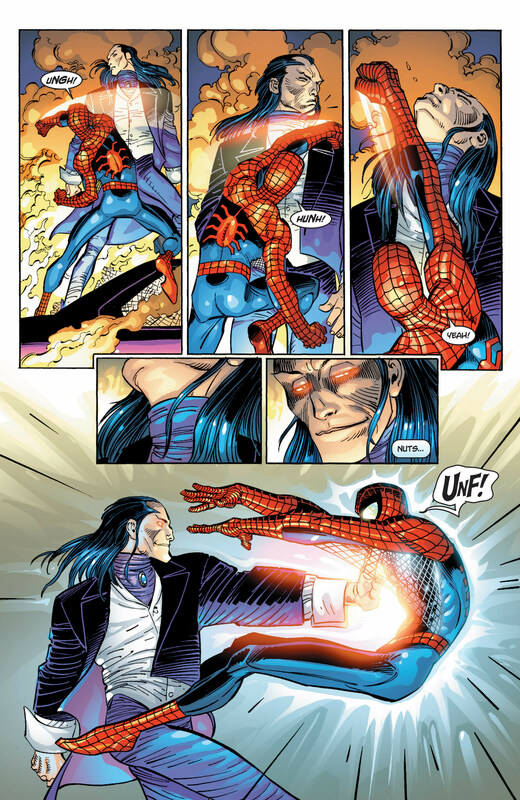 Morlun initially plays with Spider-Man from the shadows, appearing and disappearing. Eventually, he reveals himself at a fire on a wharf and delivers what Spider-Man claims was the strongest punch he has ever felt. The mysterious villain does not reveal much about himself only that he plans to kill Spider-Man and feed off of him. He also says that now that he has touched Spider-Man that he can find him where ever he goes. 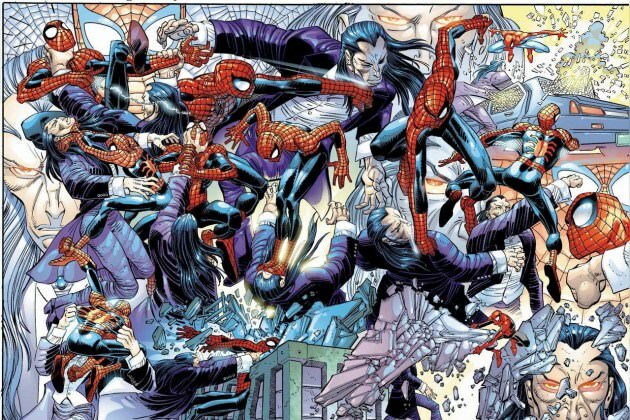 Morlun and Spider-Man battle, and no matter what Spider-Man tries it seems that Morlun always ends up on top. The fight is broken up when the building they are in collapses. Spider-Man knows however that Morlun will find him. Spider-Man manages to get his hands on some of Morlun's blood which he analyzes and finds a weakness that he can exploit. He goes to a nuclear powerplant and injects himself with radiation at a dose high enough to kill a normal human being. When Morlun appears and tries to feed on Spider-Man he is overwhelmed and poisoned by the radiation. Peter explains that the spider than bit him was radioactive and not simply a pure totem. Morlun can absorb the energy of the totem but is weakened and poisoned by the radioactivity. 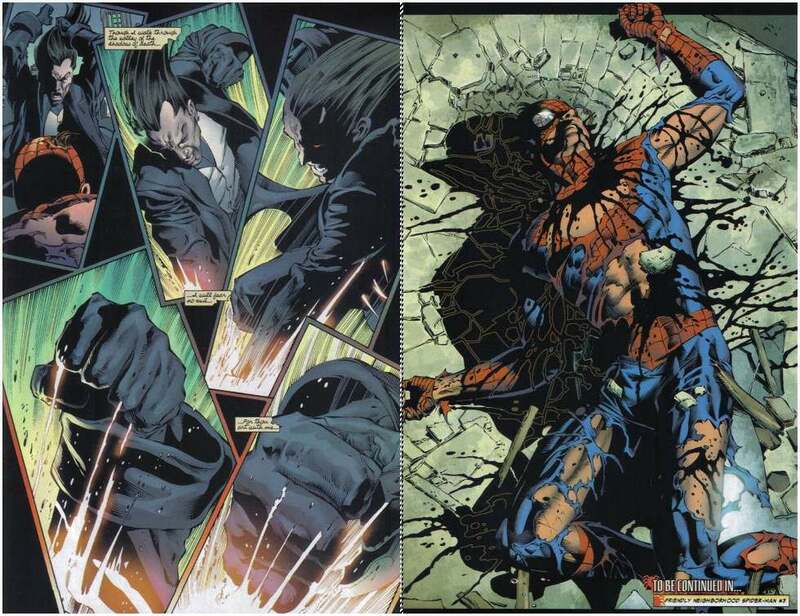 With every punch Spider-Man throws at him Morlun absorbs more radioactivity and begins to disintegrate. 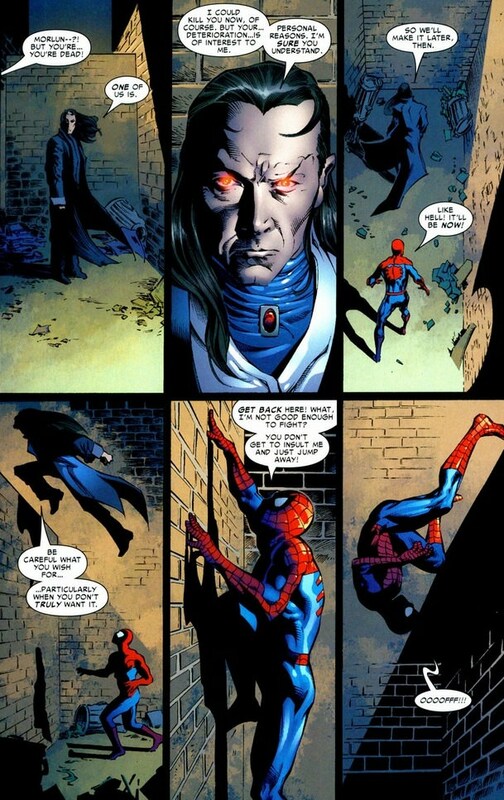 Morlun pleads for his life saying that he is only doing what he does for survival. Before Peter can make up his mind Dex an sociate of Morlun shoots him. He distingrates and apparently dies. 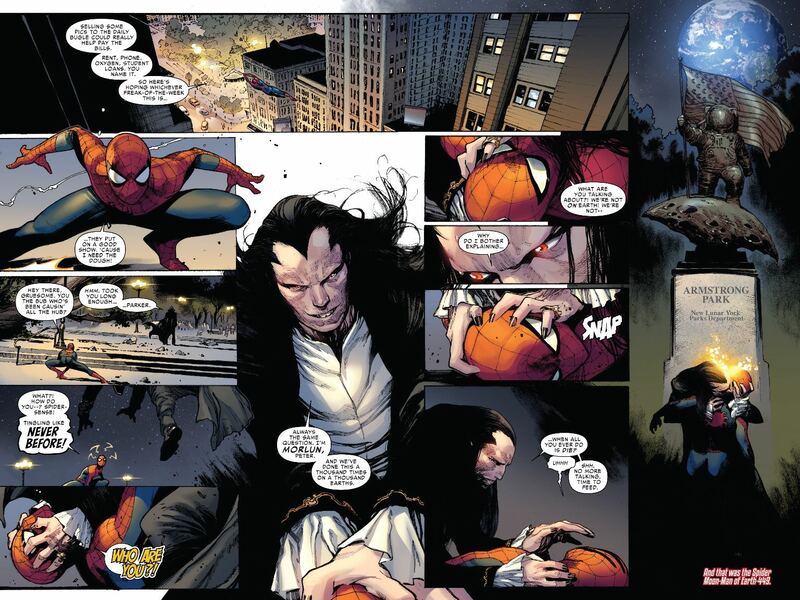 Morlun has returned from death and faced both Spider Man (The Other storyline) and the Black Panther. Morlun is now the primary antagonist in the Spider-Man event the Spiderverse. Imprint Target - When he touches some one they are imprinted into Morlun's mind and he can then always find them. Feeding - Morlun feeds off of Totems and seems draw energy from them. Spider-Man says that Morlun has punched him harder than anyone (Including the Hulk / Thor). Morlun was able to tear through an Adamantium net with ease when battling the Black Panther. When Spider-Man swings a long distance between buildings, Morlun is able to appear briefly later showing his high level of speed. Here are some of Toylab's favorite Morlun panels and pictures.